They match the drapes. AT THE CIRCUS. his right sock Originally uploaded by caramaria. 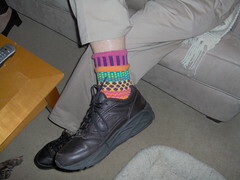 This is one of a pair of socks, CLOWN SOCKS, which my father bought in Maine which he HONEST TO GOD was wearing when he and my mother arrived at our house last night. They were just settling in on the couch when I heard J say, excitedly, "Check it out! Look!" And I looked and there they were. My father happily explained that each was different. While the left one featured yellow stripes the right featured pink. Honestly. This is a real photograph I took with a digital camera in our living room.